The Chaplain Alliance for Religious Freedom has responded to a secularist group's demand that chaplains at a New Hampshire military base not be allowed to offer invocations at on-base events. On Feb. 6, a lawyer with the Wisconsin-based Freedom From Religion Foundation sent a letter to Lt. Col. Thaddeus Day at Pease Air National Guard Base on behalf of guardsmen who complained that official Air National Guard ceremonies at Pease International Tradeport "regularly include invocations led by a chaplain." The FFRF letter asserts that having invocations and endorsements of religion at military and government events that employees are required to attend is a violation of the Establishment Clause of the First Amendment to the United States Constitution. The letter calls on Day to end the practice of prayers and Bible readings at official Air National Guard events and argues that the Supreme Court mandates that the government maintain neutrality toward religion. The Chaplain Alliance for Religious Freedom, a coalition of over 30 agencies that endorse over 2,600 military chaplains, responded to the the FFRF letter by asking the Texas-based religious freedom law firm First Liberty Institute to send a letter to the base's commanding officer, Col. James P. Ryan, telling him that there is "no legal requirement" for him to give into FFRF's demands. The letter was written by First Liberty senior counsel Mike Berry, the director of the law firm's military affairs department. The letter was sent to Ryan on Tuesday. "Their demands appear to be based on the flawed notion that military chaplains cannot offer invocations at ANG functions. The FFRF's position and legal argument are incorrect," Berry explained. "Federal law, military regulations, and court precedents belie the FFRF's specious claims." "Uniformed chaplains are clearly permitted, indeed protected, when they offer invocations at military functions," he added. Berry cited the Religious Freedom Restoration Act to argue that the military and government are forbidden from burdening a person's religious exercise unless there is a "compelling government interest" to do so. "This standard, known as 'strict scrutiny,' is a high hurdle for the government to clear when it seeks to censor or prohibit religious expression," Berry wrote, adding that the National Defense Authorization Act states that the Department of Defense "must accommodate individual expressions of religious belief, which undoubtedly include a military chaplain's invocation." "Contrary to the FFRF's assertion, there is no exception when such individual expressions occur during military functions," Berry added. Berry also pointed out that Department of Defense instruction 1300.17 "arguably affords even greater protection" than Section 532 of the National Defense Authorization Act. "The Air Force also publishes a Book of Prayers for its chaplains. The Book of Prayers contains numerous sample prayers that can be used by Air Force chaplains," Berry stated. "Notably, the Book of Prayers offers sample prayers for both religious and non-religious military occasions. Unlike the FFRF, the Air Force's position is that invocations may be offered during non-religious military functions." Additionally, Berry states that precedent was set in 1997 when the U.S. District Court for the District of Columbia ruled in Rigdon v. Perry that when military chaplains are acting in their religious capacity, "it is wholly appropriate for them to advance their religious beliefs in that context." That ruling, Berry argues, upholds that the religious conduct of chaplains is protected under the First Amendment. "In conclusion, the Constitution, federal law, and Department of Defense regulations all support your practice of permitting uniformed chaplains to offer invocations at command functions," Berry wrote. "Moreover, those legal authorities actually forbid military commanders from censoring or prohibiting such invocations." 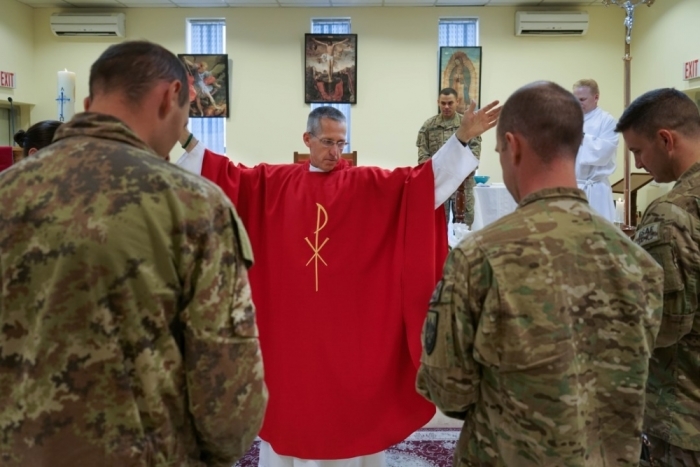 Retired Army Chaplain Ron Crews, the executive director of the Chaplain Alliance for Religious Liberty, said in a statement that "military chaplains exist to ensure all service members have the right to free exercise of their religion." "The prayers and Bible readings they offer at Pease Air National Guard Base are one of many ways they faithfully discharge that duty," Crews said. "Their faithful service should be respected, not attacked."